In many kitchens prep work takes a huge hunk of the overall cooking time. The Cuisinart Mini Food Processor stands ready to help dice and chop those onions (no more crying!) along with celery, carrots, etc. Its also very useful for making ham or chicken salad  the texture is just right when run through a system this size. I love, love, love the size of this machine! It takes up hardly any space and its absolutely ideal for making small batches of everything from mustard to chopped nuts. By using the pulse feature you can get some variety in chopping size. This also helps get stubborn chunks of food into the blades more readily. For a really fine chop, just turn it on and let it go! Moms out there  try using the Cuisinart Mini Food Processor for making baby food. The smoothness wont disappoint. Other features I appreciate are the easily removed bowl that doesnt require removing the blade to detach it from the base. The handle on the chopping blades makes it very simple to remove it from the food without ever touching the food, or the blades with your hands  nice safety feature! The price on this little chopper is hefty unless you get a deal. Other than that I really couldnt find much negative to say about this processor. As long as you recognize that a small processor doesnt offer you the same variety of cuts as a larger one, you wont be disappointed. 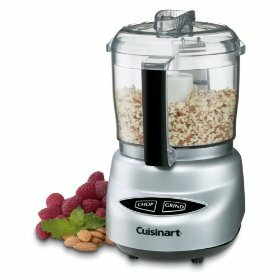 People who have purchased the Cuisinart Mini Prep Plus Food Processor seem generally happy with the products performance. Those who have owned different brands say that the Cuisinart measures up to the competition very nicely. The only complaints discovered were regarding longevity (one person used their chopper once a week for 18 months and it stopped working). To be honest, 18 months use on a small kitchen appliance isnt bad if my home is any measure. Another complaint had to do with having to cut things small to get them into the processor, but youll encounter that issue with any food processor of this style/size. Easy clean up (includes spatula  really nice addition!). If you can get this on sale, its similarly priced to other small machines. The size is ideal for small projects but not for anything more extensive. The longevity of the machine seems to be a little iffy but a lot here depends on how heavy your usage is. If you do a lot of chopping you may want something more powerful and that offers more finishing options (like julienne). But for small jobs, the Cuisinart Mini Prep Plus Food Processor will do the trick very nicely. List price for this food processor is around $60.00, when I wrote this review Amazon had it for $36.95 and it ships free with Super saver.